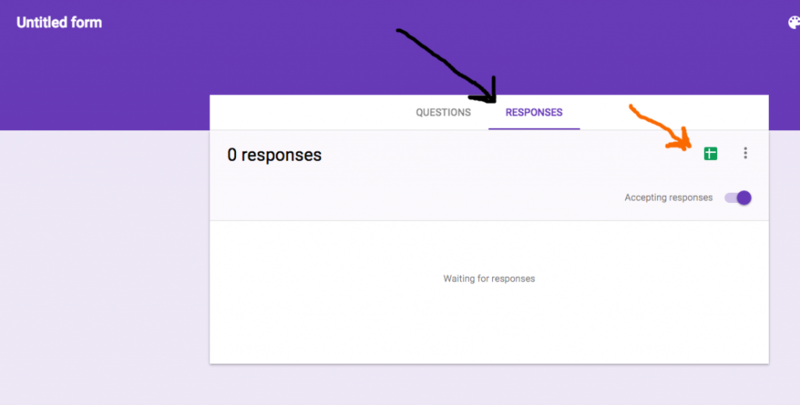 Google forms is an easy to use form builder that has many uses. One advantage of Google Forms is that is is effectively free, either within ‘consumer’ Google Accounts, or more importantly is business Google Apps for Work / Education / Government accounts. When automating a business process between cloud solutions, systems communicate via API calls. 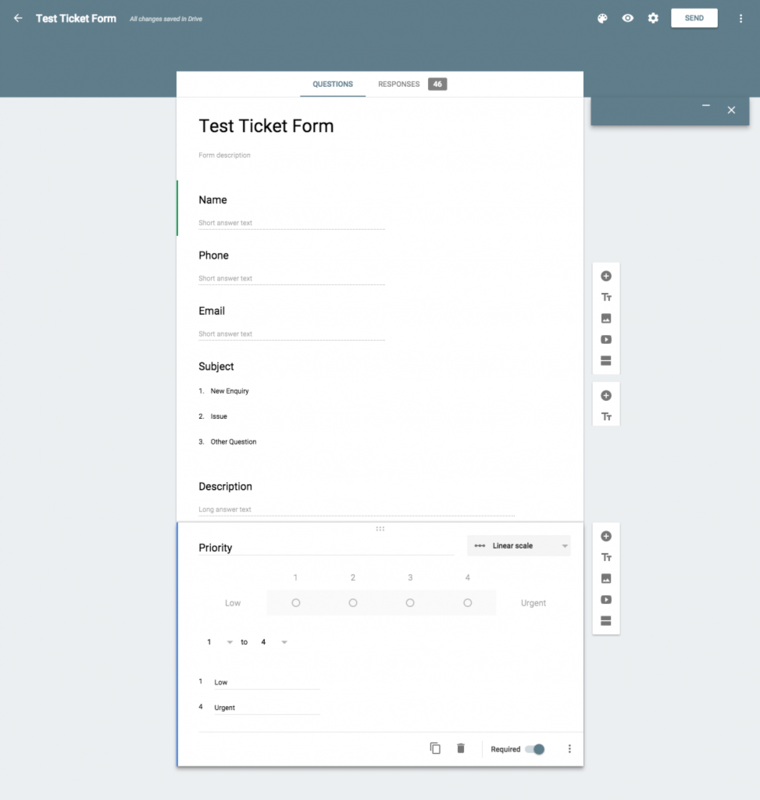 In this example, I want to use Google Forms as a front end to FreshDesk support ticket system. FreshDesk is an excellent tool and comes already with Web Forms / Widgets that allow you to input via forms – so why do this? Also, if you are interested, take a look at my post on integrating Google Sheets to WordPress via the Rest API. Well the FreshDesk forms don’t have a whole load of fields, and using the API allows some additional fields, that may be important to your business process. I prefer to use the new Google Forms, so this tutorial will focus on that, but if you use the classic forms the process is about the same. Using the form editor give your form a name, apply styling etc and add your questions, one by one, setting mandatory ones as required. And then add some validation to the fields. With Google Forms you can perform advanced validation including using Regular Expressions. Inside a form field, on the bottom right, click on in the three vertical dots and tick ‘Data Validation’ to reveal the extra options. Test your form, using the eye icon (preview) at the top right. This is a simple, but necessary step. Whilst Google Forms can accept entries without a Sheet, we will need the sheet, as that is where the Google Script will run to make the API call. First, on your form in ‘edit’ mode, click on ‘responses’ tab – and then click on the green ‘create sheet’ icon on the right top corner. This will create a Google Sheet for you. In this example I am calling FreshDesk. Most APIs are very similar and most are REpresentational State Transfer (REST), allowing you to make “RESTful” operations like read, modify, add or delete data. So this example can be adopted to many systems, not just FreshDesk. Detail will vary of course, in terms of authentication and methods. First find you Google Sheet and open it, and on the top menu go to tools > script editor and delete anything that is already there. when the form is submitted, all the API work is done in SubmitGoogleFormData, the the initialize script just prepares the the ground work. The ‘try’ section is where the API code goes. So adding the URL for requestbin is straight forward. The details of exactly what goes into each will vary by destination system and you will have to refer to the API documentation. For this example (as it applies to FreshDesk ) I will assume that authentication is ‘Basic’ and that the payload is JSON. Lets build the main payload data first, lets first grab the columns we need, the following code works for my example – but you will need to look at your results spreadsheet to check where the columns are, because that get set by the sequence you build the form. So take a look at you own results sheet. If we put this all together, we will be able to check the right data is being constructed, by firing this up and examining (refreshing) requestbin. Once you have done that, go to your Google Form and input an entry, if all is well, you should be able to go to your requestbin url, hit refresh and see nicely structured form data. If you do, move on, if you don’t take a look in the script editor View > Logs to try and find out what when wrong. Of course mydomain needs to be your FreshDesk domain. And start testing, if all is correct you should be creating tickets from your form. The above uses moderately advanced techniques and the tutorial is intended for those with programming / development experience. If you have business processes and system integrations requirements that could benefit your business and you don’t have the skills, knowledge or time, why not contact us at Fullworks and see how we can help your business and teams become more effective through technology.